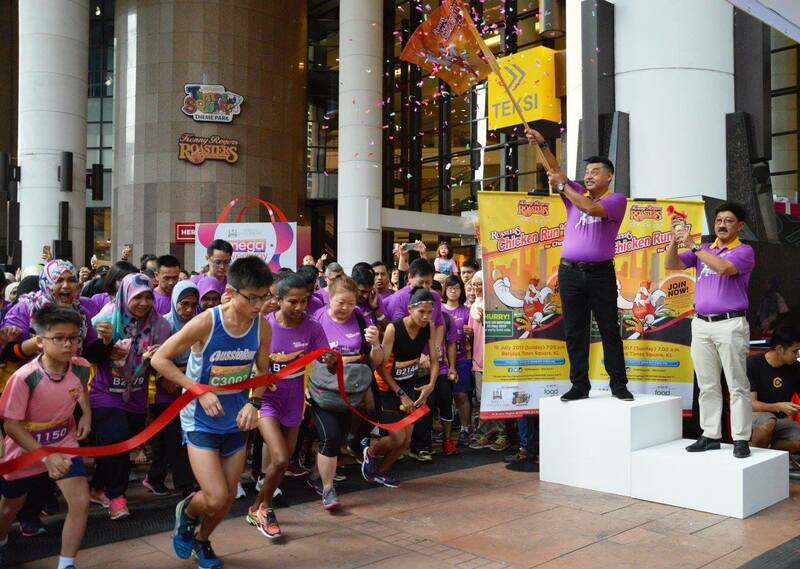 Berjaya Times Square was swarmed with more than 2,000 runners during the 13th ROASTERS Chicken Run (RCR), organised by Kenny Rogers ROASTERS (KRR). The atmosphere was radiating with energy when the enthusiastic participants engaged in an upbeat warm-up session by Sports Toto Fitness before getting ready for their respective categories. “Coming back for the 13th year, it is exhilarating to see the continuous support we get from the public. 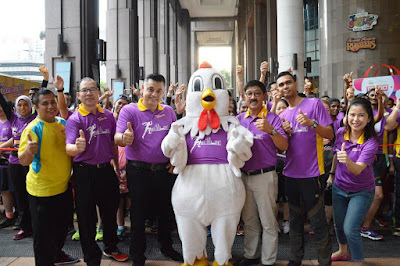 RCR is one of the significant events in our calendar because it fits our objective to promote healthy living and also allows us to give back to the community by lending a hand to organisations like Food Aid Foundation that are operating to help the needy by providing basic necessities such as wholesome meals,” said Sydney Quays, Chief Executive Officer of Berjaya Food Berhad. “A huge part of the funds raised from this event will be translated to nutritious wholesome meals contributed to the needy while the remaining will be donated to various organisations through Food Aid Foundation. We have reached out to 35 homes and organisations and contributed a total of 3,340 wholesome KRR meals between July 2015 to March 2017,” added Sydney. 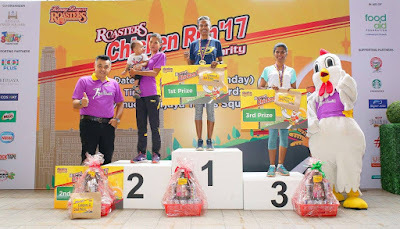 The funds from ROASTERS Chicken Run 2017 will be translated into more than 2,000 sets of Kenny’s Chicken Meals to be contributed to Food Aid Foundation benefitting approximately 20 charitable homes for both young and old. The remaining funds will be utilised to purchase ingredients and groceries to home which are also supported by Food Aid Foundation. Food Aid Foundation is a non-profit organisation that operates as a food bank which provides basic food to charitable homes, rehabilitation centres, feeding centres, poor families and destitutes. 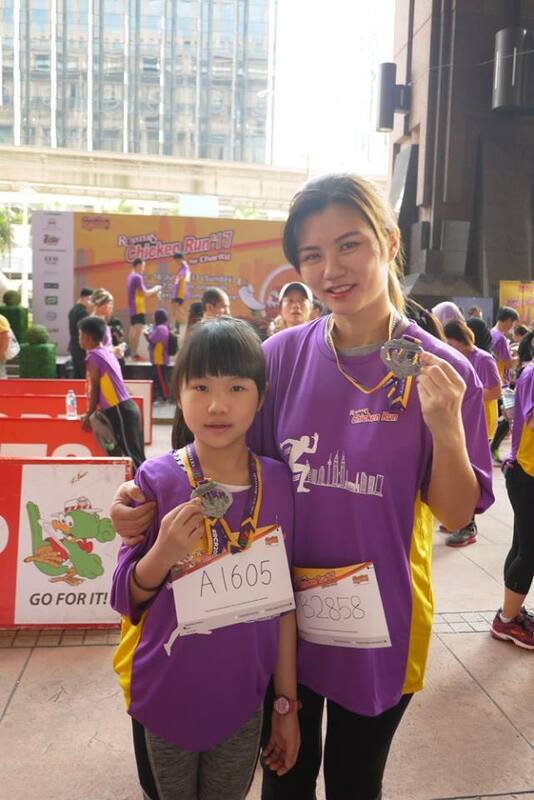 “It is a privilege to give our support towards this meaningful event. In our three years of partnership with KRR, it is heartwarming and humbling to see the generosity from KRR and fellow Malaysians in helping extend our reach to a greater number of people in need by providing them with nutritious meals,” expressed Rick Chee, Founder of Food Aid Foundation. 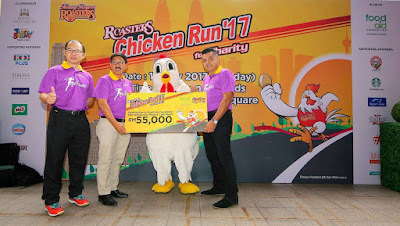 ROASTERS Chicken Run (RCR) has raised over RM 701,000 for a myriad of charitable organisations and homes such as Little Yellow Flower Foundation, Tabung Kebajikan Pesakit HUKM, Pediatric Unit HUKM (Oncology), Unit TUTUR – Aural Rehabilitation Centre for Hearing Impaired Children together with Yayasan Budi Peyayang Malaysia and House of Joy and Faith, Yayasan Sunbeams Home, Rumah Juara, Rumah Kanak-kanak Tengku Budriah, Rumah Sayangan, Malaysian National Kidney Foundation – Dialysis Treatment for the Young, Rumah Hope, Rumah Kebajikan Anbu Illam, Rumah Charis Ti-Ratana Welfare Society, and Tabung Kebajikan Pesakit PPUKM – Young Diabetic Patients. 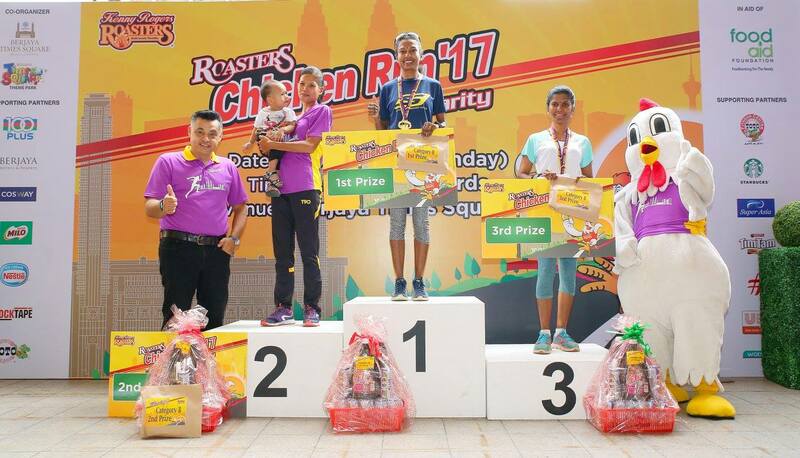 The ROASTERS Chicken Run 2017 is co-organised by Berjaya Times Square, Berjaya Time Square Theme Park with Ultron as its supporting partner. Other supporting partners who made this run possible are 100 Plus, Berjaya Hotels & Resorts, Campbell’s, Cosway, Kenanga Investment Bank, Milo, Nestle, RockTape, Salonpas, Sports Toto Fitness Centre, Starbucks, Super Asia (SAE), Unilever, and Watsons. 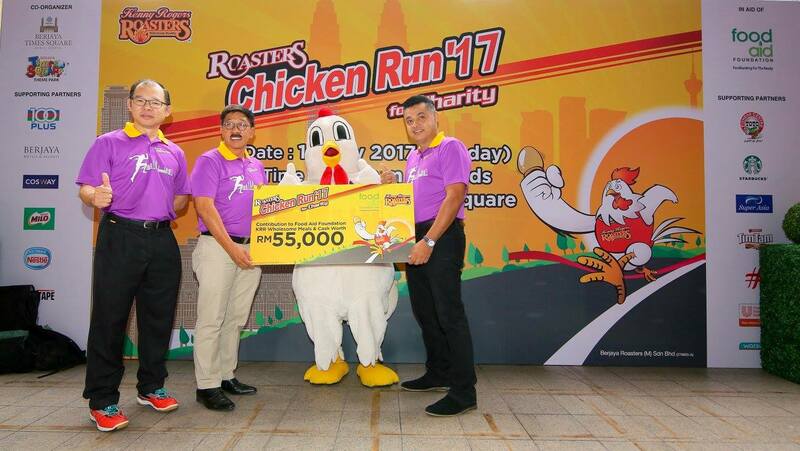 The ROASTERS Chicken Run is one of the many initiatives in the KRR Community Chest Campaign, established in 2005 in aid of the less fortunate. The commitment of KRR towards their Corporate Social Responsibility (CSR) initiative has allowed them to bring back the Social Media Excellence Award – Corporate Social Responsibility Sector. It's great to go chicken run... Get exercise and do charity at the same time..
Wow such a good way to kick start sunday. This is fun! Well, do they have to get KFC chicken after the run? Its been a while since I join Chicken Run! It always so happening and exciting during the run!